The last month has focused on finalising plans to submit to the local council for planning permission to undertake the demolition and building work required for our new premises. 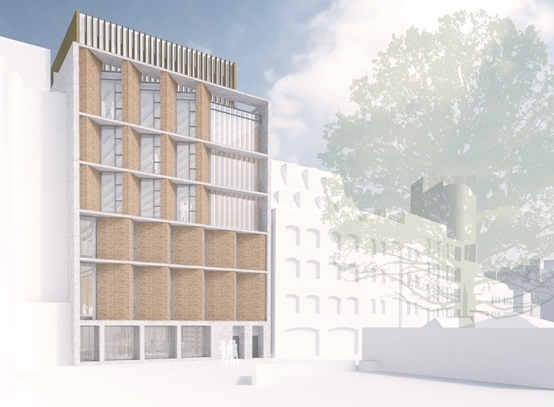 College architects Bennetts Associates have refined the plans following feedback from College members and staff. Detailed plans have been submitted to Tower Hamlets Council and we expect an initial response within 3 months. During this time the Council will consult with local businesses and residents and the plans will be referred to the Greater London Authority for approval. Pre-application discussions with both organisations have been encouraging. Last month I described how each of the seven floors will be used. The most impressive part of the building is the double height atrium and reception area, with members’ room, library and stairs leading up to the lecture theatre and breakout rooms. 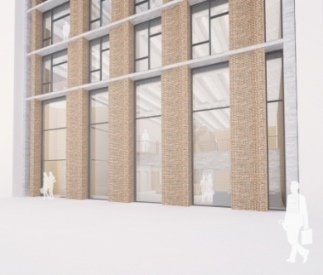 The proposed building incorporates floor to ceiling windows on all floors to maximise natural light in the building. The two-storey entrance hall and three-storey breakout area at the back of the building will ensure that plenty of light reaches the centre of the building. An automated lighting system will operate only when required to reduce energy consumption. Environmental considerations have been taken into account with steps taken to minimise heating and cooling bills. High level windows on each floor will open at night to allow air to cool the concrete ceilings, which will then keep the building cool the following day. The building will have a ‘biodiverse green roof’, which will provide a habitat for local birds and insects and reduce water run-off. There will also be solar panels on the roof. Brick pillars on the façade and back of the building reflect the appearance of warehouses, which previously stood on this site, and complement adjacent buildings. You can view the planning application on the Tower Hamlets Council website.